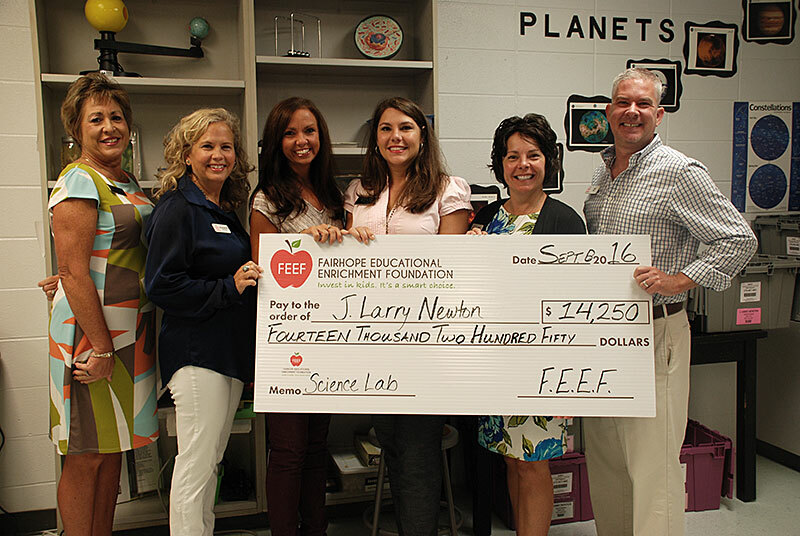 With generous support from the community, FEEF recently donated more than $70,000 to jumpstart or continue programs for Fairhope public school students during the 2016-17 school year. 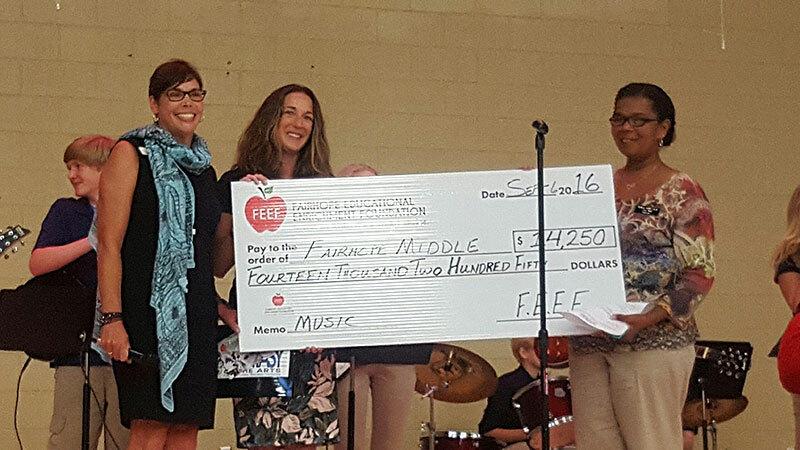 FEEF board members and directors announced the gifts at a series of “back to school nights.” Each school receives $14,250 to support programs such as LEGO robotics, science lab, engineering, math, music, theatre and art. In addition, the non-profit recently donated a matching grant to The Pelican’s Nest Science Lab for updated equipment. 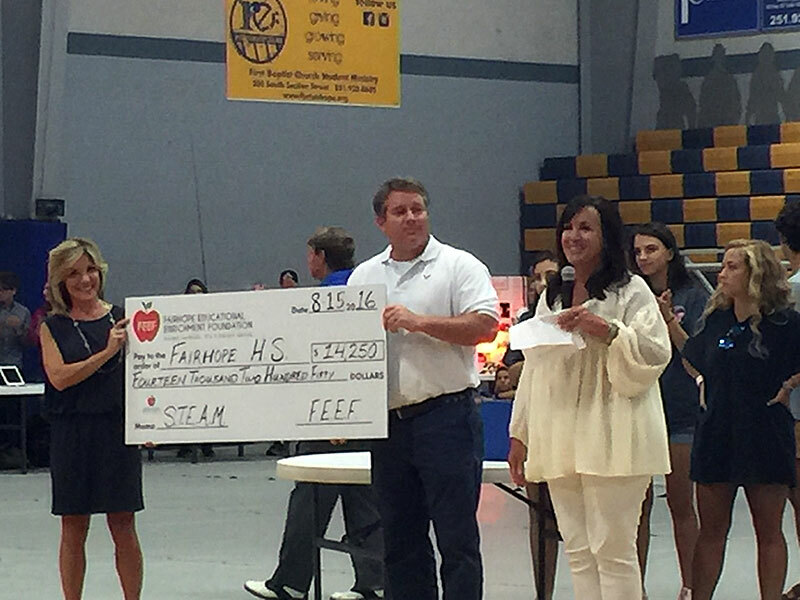 “These dollars, generously gifted by individuals and businesses in the community, allow Fairhope students to participate in programs that would not otherwise be available with state or local funds,” said FEEF Executive Director Cori Yonge. FEEF programs place an emphasis Science, Technology, Engineering, Art, and Math. Yonge said teachers would be able to apply for additional grants throughout the year. 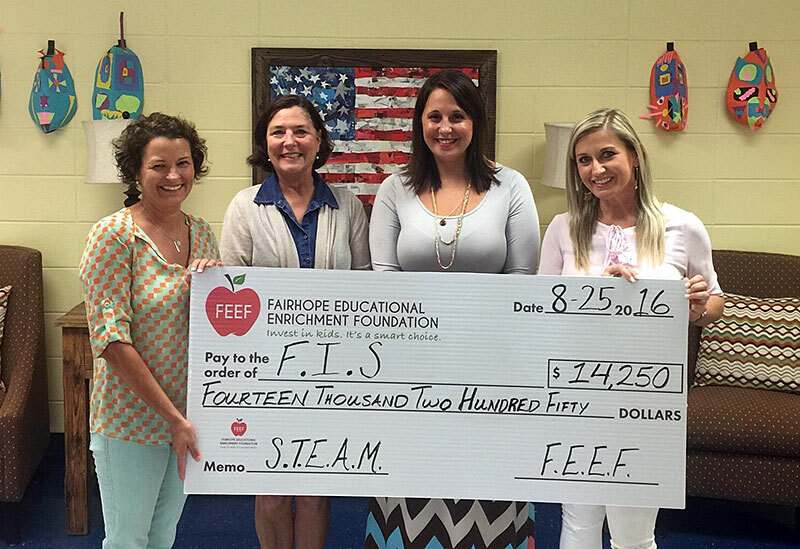 Fairhope Elementary staff accept a check for their proposal to integrate LEGO Robotics, computer coding, and art into student curriculum. 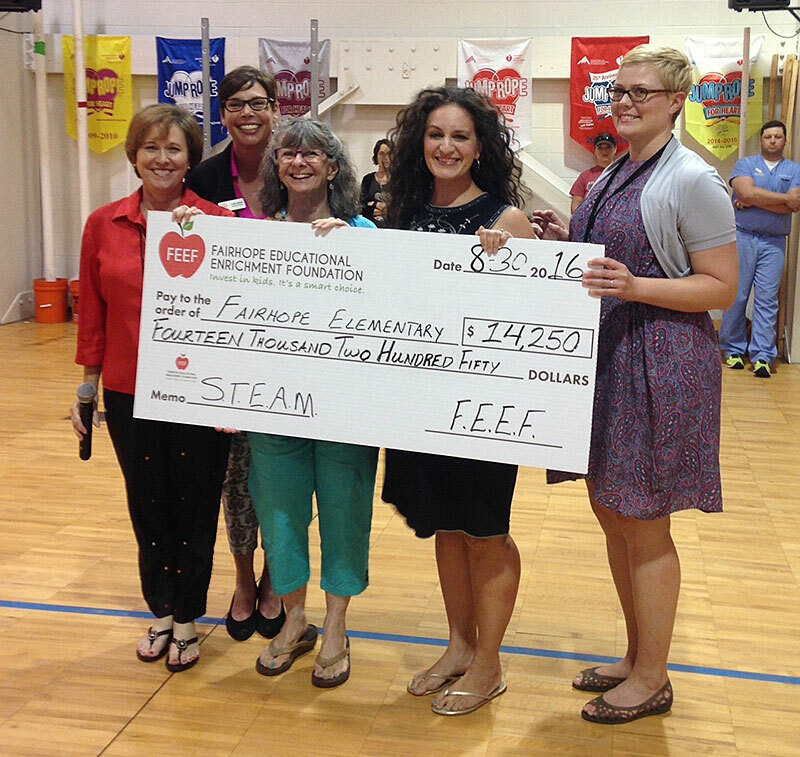 From left, principal Julie Pierce, FEEF Executive Director Cori Yonge, teachers Judy Humphrey, Kacie Hardman, and Hilary McKinney. FEEF Board members Anne Frost Kennedy and Jennifer Busby present dollars to support a hands-on science lab at Fairhope Intermediate School. From left, Kennedy, Principal Carol Broughton, Assistant Principal Christina Stacey, Busby. FEEF marketing team Erin Hendricks (left) and Kathy Sternenberg (right) award a grant to Fairhope High Principal Jon Cardwell. J Larry Newton students will use the dollars to pay for hands-on science lab. From left, BCBE Assistant Superintendent Hope Zeanah, FEEF Administrator Kellie Boudin, science lab teacher Amy Travis, Principal Patrice Krueger, FEEF Board members Carrie Mackey and Erik Nist. FEEF representatives Cori Yonge and Ashley Gordon present Fairhope Middle Principal Angie Hall with dollars for guitar lab.